Almost a thousand people paid their respects to San Luis Obispo Fire Chief John Callahan at his memorial service Friday morning. 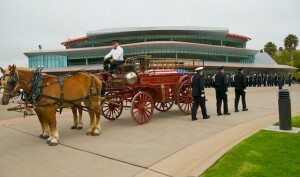 The chief’s casket was transported in a horse-drawn 1906 Seagrave Chemical Wagon to his memorial which was held at Cal Poly’s Performing Arts Center. Callahan died while playing softball at Santa Rosa Park in San Luis Obispo on Aug. 18. Rest in peace Chief Callahan. You are a good man and were a great public servant. Don’t ever be so irresponsible with taxpayer money again: SLO mayor, city council members and select city department heads.